The New Yorker columnist Andy Borowitz delivered the perfect response to Paul Ryan and Mitch McConnell’s apparent fear of answering reporters’ questions. All hell has broken loose within ranks of the leadership of the Republican Party in the wake of the endless stream of controversies and legal sagas surrounding the Trump administration and the GOP’s inability to effectively govern despite the fact they control both houses of Congress. Both Speaker of the House Rep. Paul Ryan (R-WI) and Senate Majority Leader Mitch McConnell have done their very best to avoid questions from reporters, particularly when it comes to the Trump. New York Times best-selling author and comedian Andy Borowitz took to his column – The Borowitz Report – and weighed in on the spineless nature of both men last year, shortly after Trump’s inauguration, with a brilliant and humorous faux report aimed at the lack of courage and political savvy in the face of media scrutiny on the part of Ryan and McConnell. That column seems particularly relevant in light of the conspicuous lack of any meaningful comments, statements or dialogue with reporters in the wake of recent scandals ripping the White House and the Republican party itself to pieces in recent weeks, particularly when it comes to answering questions regarding protecting Special Prosecutor Robert Mueller from being fired by Trump in the middle of his Russia investigation. 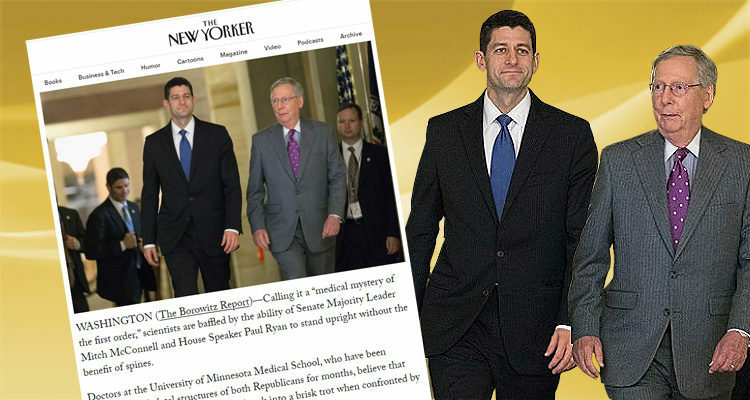 Bearing the title: “Scientists Baffled by McConnell and Ryan’s Ability to Stand Upright Without Spines,” Borowitz’s article begins by spoofing an article about an actual scientific study. Calling it a “medical mystery of the first order,” scientists are baffled by the ability of Senate Majority Leader Mitch McConnell and House Speaker Paul Ryan to stand upright without the benefit of spines. Dr. Logsdon explained that the only explanation was what he called “the startled-deer hypothesis,” as Borowitz’s narrative continued.